Maybe you have had enough of the 100-degree heat or the 2-hour lines. Maybe your trying to avoid the rain. 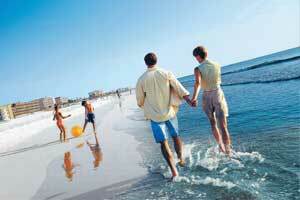 Orlando has more than theme parks to offer. There’s so much to do that won’t break your bank and provide you with a full day of excitement. Orlando has some of the best shopping anywhere. You don’t have to break the bank. 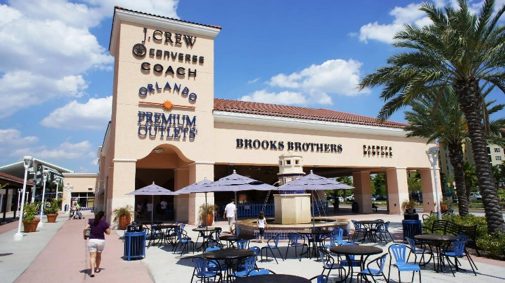 Orlando boasts 2 main factory outlet malls. Everything from Polo, Coach, Michael Kors and Nike. The malls are huge and can take an entire day to walk. Great deals can be found at all stores. An insider’s tip is stop by the guest services desk, they usually have some great discount books. Sometimes there’s a small fee and sometimes free. You can walk and shop all day. When you get hungry there are food courts and restaurants nearby. Conveniently there is one outlet mall on each end (north and south) of International drive. Relatively new to the International Drive Area is I-Drive 360. Take a moment to escape and see the magic and wonder Orlando offers. The Coca-Cola Orlando Eye offers a new and unique way to experience the beauty of Orlando, also known as the ‘City Beautiful’, and see it in a way you’ve never seen it before. Be effortlessly lifted to 400 feet and experience breathtaking 360-degree views of surrounding Central Florida. Located at I-Drive 360, the heart of International Drive, the Coca-Cola Orlando Eye is the tallest observation wheel on the east coast of the USA. The gradual rotation in one of the 30 high-tech capsules gives you an ever-changing perspective. Each capsule contains Apple iPad Air tablets which allow you to explore and learn more about the landmarks and surroundings in several languages and effectively see beyond what the eye can see. A flight on the Coca-Cola Orlando Eye will lift you high enough to see the sights of downtown Orlando’s skyline, nearby theme parks, beautiful lakes and lush landscapes, with views all the way to Cape Canaveral on Florida’s east coast. 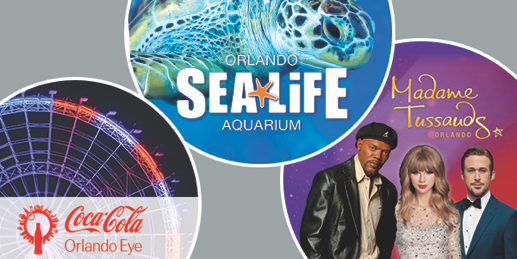 In addition to the Coca-Cola Orlando Eye, guests can also experience the Madame Tussauds, the world’s most famous celebrity wax attraction, and SEA LIFE Orlando Aquarium, the immersive underwater experience, rounding out three of the top global brands in Merlin Entertainments’ portfolio of exciting attractions. I-Drive 360 also boast many restaurants and night clubs. They also offer free covered parking and is very close to all I-drive Trolley stops. An indoor amusement park for the mind combining education and entertainment with more than 100 hands – on exhibits for all ages. 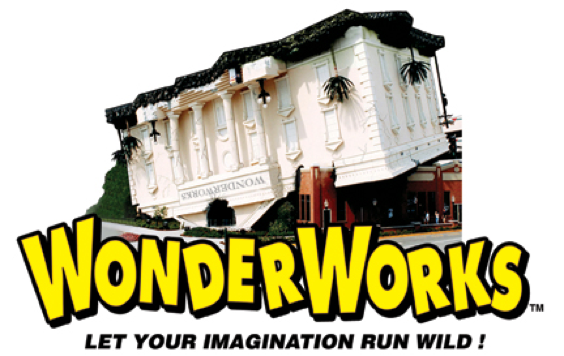 Wonder Works began as a Top-Secret research laboratory, led by Professor Wonder, on a remote island in the Bermuda Triangle. During an experiment gone awry, a manmade tornado unleashed through the laboratory and created a swirling vortex that carried the building thousands of miles away, landing it upside-down on top of a brick warehouse on International Drive in Orlando, Florida. Remarkably, all the experiments remained intact and functional. As you enter the upside-down attraction, the ceiling will be under your feet and the ground will be above your head, making it impossible to explore what’s inside. To begin your adventure, pass through the inversion tunnel and defy gravity as you are properly aligned! Once inside, you will be able to explore six Wonder Zones: Natural Disasters, Physical Challenges, Light and Sound, Imagination Lab, Space Discovery and the Far-Out Art Gallery. Journey through each zone, testing your knowledge, physical capacities and creativity! Become a human lightning rod by touching 10,000 volts of electricity or experience hurricane force winds! Gather up your strength to lift your weight using a pulley system or build up courage to lie down on a bed of 3,500 rising nails. Navigate through space on a mission to Mars and design and ride your own roller coaster! Make your way up to the basement where you’ll find more thrilling adventures, including an XD Theater 4D motion simulated thrill ride, 3-story indoor ropes challenge course and laser tag. While visiting, upgrade to a combo package and stay for the Outta Control Magic Comedy Dinner Show. Expect to be impressed with the combination of magic, impersonations and high-energy, improvisational comedy. Unlimited pizza, salad, popcorn, beer, wine, soda and dessert will be served. Main Event Entertainment, the fastest growing entertainment destination is an ideal place for groups to get together and let their fun out. 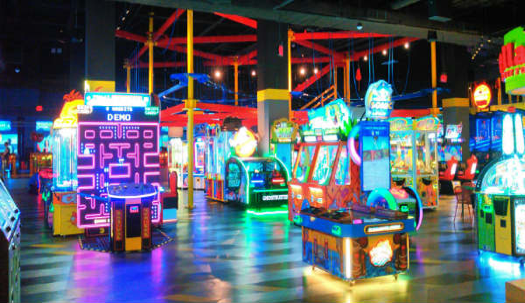 Main Event combines dining, virtual and interactive game play, high ropes adventure courses, billiards, 61 big screen TVs and state-of-the-art bowling in nearly 50,000 square feet. Their Eat.Bowl.Play experience features a chef-inspired menu featuring innovative American fare and handcrafted cocktails in a high-energy bar and grill atmosphere and signature-style artisan pizza at LaBella’s, the center’s fast casual café. Main Event also offers full-service catering with private rooms, free Wi-Fi and the latest audiovisual technology for private events such as holiday parties, company meetings, birthday parties, and social gatherings. In addition to its unique Eat.Bowl.Play experience, Main Event offers full-service catering with private rooms, free Wi-Fi and the latest audiovisual technology for company meetings, team-building exercises, holiday parties, social gatherings and large group events. Additionally, Main Event consistently is ranked the “best place for parties,” offering a variety of party packages to entertain guests of all ages. Main Event centers serve more than 500,000 guests annually and bring nearly 150 full- and part-time positions to their local communities. America’s Escape Game offers a new and exciting amusement! Real-life room escape games are a type of physical adventure game in which people are locked in a room with other participants and must use elements of the room to solve a series of puzzles, find clues, and escape the room within a set time limit. At America’s Escape Game people are teamed up in groups of 2-10 and locked in a room. They have 60 minutes to work together, solve the riddles, solve the puzzles and escape. We currently have 4 experiences to choose from, each with their very different challenges. This is great fun for a date, a family night or a team building experience as working together is required to succeed! They currently have the five (5) rooms below to choose from. “Pandemic: Project Hephaestus” Your Team needs to find the cure before the Red Death takes its toll! “Lost Tomb of Monthu” Find the mysterious red ruby and escape while there is still time! “Crisis at 1600” Secure the White House and stop a missile attack while you still can! “The Caretaker” Save the hermit caretaker from the wolves while there is still time! “Face Off” Face Off is a high energy race against time AND your opponents! This is an experience like no other. Be warned, only 10% of their guests escape! You and your friends will work together, cheer each other on and compete to escape the rooms fastest. Discover the dream of flight at iFly Oralndo. Experience the true free fall conditions of skydiving without jumping from an airplane. 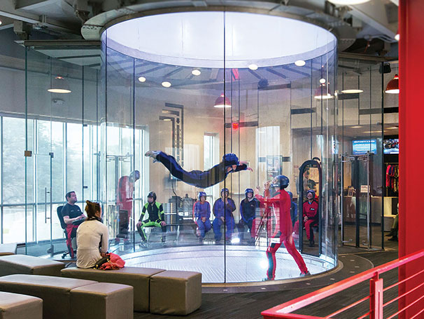 iFly’s vertical wind tunnel technology creates a wall-to-wall cushion of air on which you can safely float. There’s no parachute, no jumping and nothing attaching you to planet Earth. It’s just you and the air. Super fun, super safe, and super cool! From mild to wild there’s so much to see and do in Orlando. We’ve named just a few things here and there is so much more coming to the International Drive Area and the theme parks. Like us on Facebook and stay up to date with all the latest and greatest happenings at Best Vacations Ever including special events, announcements, offers, photos, and more. Disney Springs, previously known as Downtown Disney, is an outdoor shopping, dining and entertainment complex located at the Walt Disney World Resort near Orlando, Florida. It was recently expanded to include many new stores, such as Pandora, Anthropologie, and the Coca-Cola Store. It also has a wide variety of delicious dining experiences. Walt Disney Imagineering took inspiration for the look and feel of Disney Springs from real coastal towns found throughout the state of Florida, such as St. Augustine and Coral Gables. 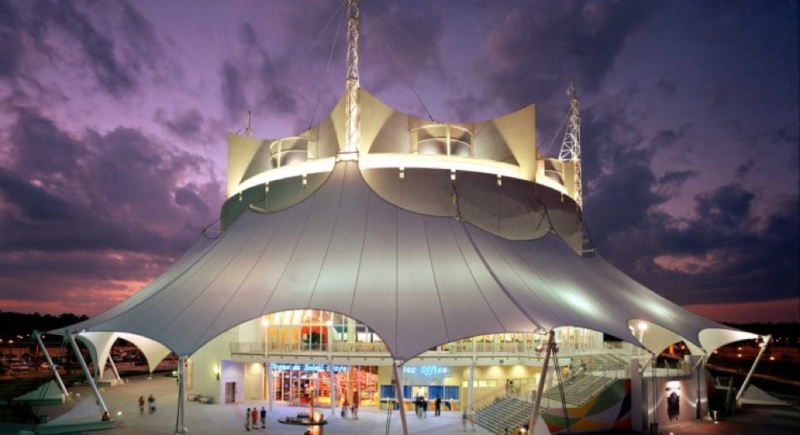 See La Nouba by Cirque du Soleil at Disney Springs before it’s gone! Earlier this year Cirque du Soleil announced that La Nouba will be ending it’s 19-year run in Disney Springs at Walt Disney World in Orlando, Florida on December 31st, 2017. La Nouba’s classic performance transforms the ordinary into the extraordinary and stimulates the imagination from beginning to end with amazing acrobatics and whimsical characters. Disney Springs is the only location where you will be able to see this unbelievably amazing show, and not for much longer. Tickets to the show are still available, and seeing the show before it’s gone is worth the trip. Disney Springs is host to 52 unique and different dining options to choose from. Whether you want exotic food or something a little more domestic, Disney Springs has got it all. The new Town Center district of Disney Springs has recently opened with a plethora of dining options that are sure to delight. Grab a burger at D-Luxe Burger or a barbeque sandwich at The Polite Pig and try one of the delicious cupcake options at Sprinkles for dessert. The Marketplace district of Disney Springs includes the Rainforest Café and its sister restaurant T-Rex, which are a delight to families visiting Disney Springs with animatronic animals and dinosaurs that move and speak during your meal. T-Rex also features Build-a-Dino, a franchise of Build-a-Bear where kids can build and dress their very own dinosaurs. The West Side District includes Crossroads at House of Blues, where there’s always good music to go with good food, Splitsville Luxury lanes, where you can bowl and eat in luxury, Bongos Cuban Café and the newly redesigned Planet Hollywood location. The Landing District, previously known as Pleasure Island, has opened several new, unique locations. It boasts nautical-themed restaurants and shops, including Jock Lindsey’s Hangar Bar, and the Boathouse, which also serves as the port for amphibious, vintage automobiles that offer cruises of lake Buena Vista. Even if you don’t take a cruise you can still watch these amazing cars take a swim while you eat. Not ready to head back to your room after a day in the parks? Take a stroll around Disney Springs. Free and family-friendly entertainment is available nightly throughout the Springs until 11pm. Check out the Waterside Stage located in the Marketplace district of Disney Spring most nights of the year— the Waterside Stage is host to all-types of performers from full band concerts to a nightly DJ Kids Dance Party. Pop-up live music is also available throughout the Landing, Westside and Town Center Districts – just take a stroll around and listen to the sweet sounds of fun.